Not many drawings this month while I've been challenging myself to paint something fully from memory or imaginary once a day throughout the month. Up on Rocky Pine Ridge with an oversubscribed Sierra Club hike. 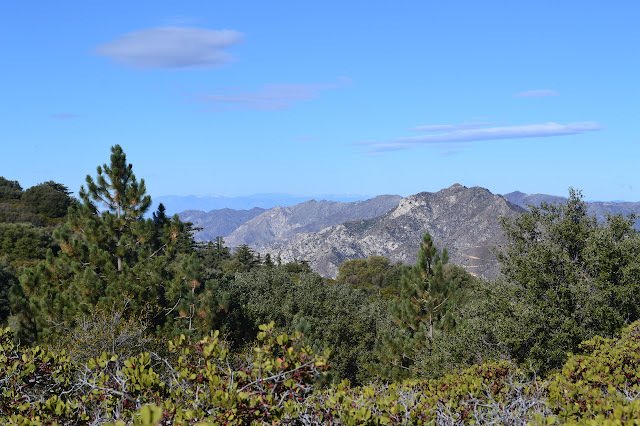 Mount Lowe may not be the highest in the area, but it certainly has a centralness to it. 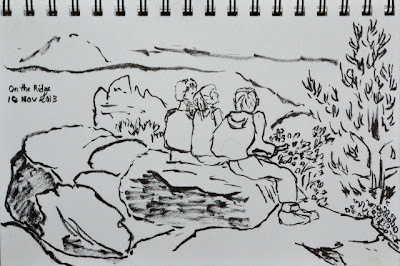 I promised the folks at HIKE the GEEK a six mile round trip with a bit of elevation change and got three takers. We met at Red Box and drove up the last half mile to the start at the road up Mount Disappointment. Crossing the road from the parking, we start up the trail and get to climbing quickly under the cover of oaks with a few pines thrown in. Switchbacks overlooking the San Gabriel River's west fork carry us further and further up until finally meeting with the road again. 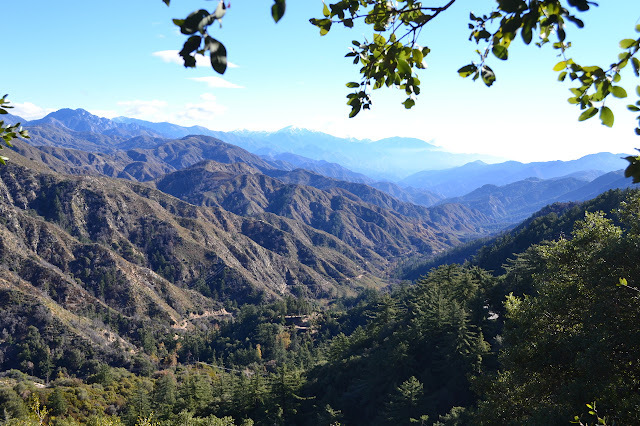 Looking northeast, we see the west fork of the San Gabriel River as it winds east. The now closed road passes a few old car camping sites including Valley Forge. The ski areas in the background seem to have a little snow. In the direction of Strawberry Peak across Arroyo Seco, there seem to be a few more snowy tops in the far distance, perhaps Pinos and the closer Sawmill. I decided to head out to the current end of Templin Highway again to check out a little more of the extreme western section of Angleles. 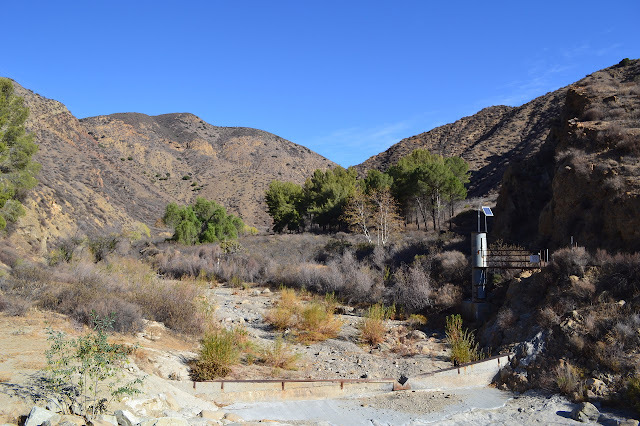 The excuse for this one is to search out five Public Land Survey System markers, all witness corners, that rest in the bottom of Cienaga Canyon, mostly along Castaic Creek. They were placed before 1958 (Liebre Mountain 7.5') as they can be found on the quad from then. Otherwise, I know nothing about them. I loaded up some guessed locations into the GPS and made a plan of attack. I would follow the canyon up, pausing from time to time to stomp through the undergrowth on the side looking for a monument, then follow the old road back down. This road was reduced to a trail in more recent maps and has been mostly removed from the 1995 quad. Still, the route up the ridge and back down can be seen from satellite, so I'm pretty confident I can follow it. The canyon bottom seems to have a bit of trail as well, although that can be an illusion. There's plenty of traffic for the lake, but no one is parked at the end of the highway. 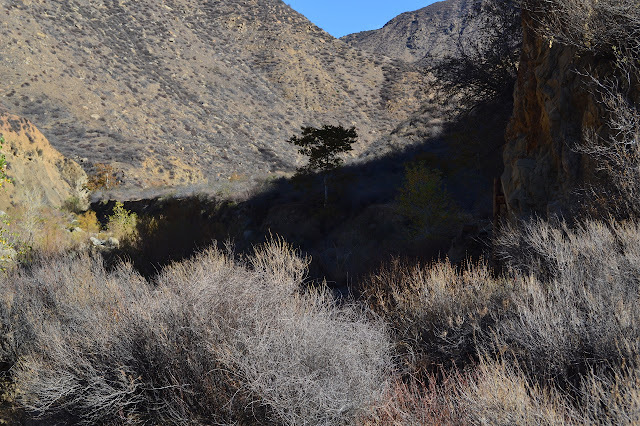 I get packed up, a task involving far too many bits of backtracking to grab a thing I'd forgotten but finally managing to be prepared, and head down the last of the pavement to the bridge across Castaic Creek. On the far side of the bridge, a road wanders past the stream gauge and starts up the canyon. I head down it for some easy initial travel. There are many footprints already on it, some of them quite crisp. Someone has camped under the trees just past the gauge, but not recently. It's a good start to what might prove to be a long hike, but just past the stub of a gate that probably marks the end of the county's inholding around the lake, I find the first washout. Still nothing for the county's stream gauge to measure. That tamarisk can't help. The base of a gate at the edge of a big washout along this old road. The washout isn't too hard to cross and at the end there is more road and more easy travel. There is another washout before the first ford. The ford is delicately eroded over the top and terribly undermined at the bottom, but still has a depth gauge so you can see how crazy it might be to try to cross the stream in a flood. The high tension wires crackle above and an old car frame rusts, bringing together a collection of the ways civilization affects the remote outposts it passes through. Eventually, the road is washed out again and stays that way for a while before a second ford just below an old stream gauge. Past this, there is not a lot of road in the canyon. The old ford still looks usable. I don't think I would want to if the water was high enough to register on the depth gauge on the right. Respect the saw, especially the teeth, for they are long and sharp and will bite if given the chance. Respect the ax, and always swing it so that if it deflects, it must go through some great obstacle like a trunk or the ground to get to you. Respect the tree, for it may suddenly try to fight back in an unexpected way. Check for death from above before sitting down below. There's obviously quite a few details that go into each of those, like not placing yourself in a position where the saw teeth could rake across a body part even if it seems unlikely to be able to reach. 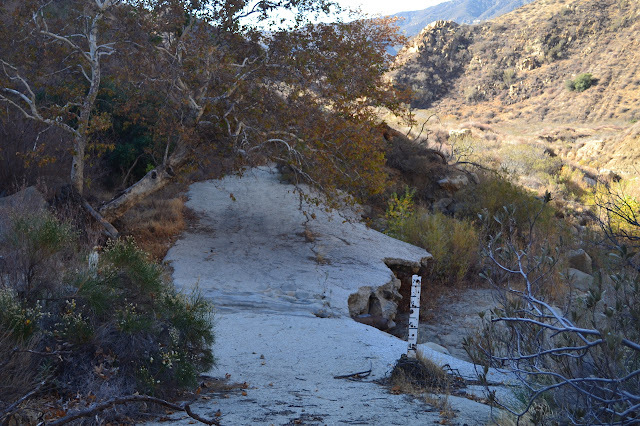 With paperwork signed and safety gear tallied, we start up the trail and into the Sespe Wilderness. The trees come quickly. My first thought at hearing about a crew going up the Thorn Point Trail was, "That trail hasn't got any trees on it," but when I get there, the thought changes to, "Oh, right, THAT tree." The first one is huge. It has a hiker trail going down the slope a little way and then under it and a second that goes down a little further and over. We scope out the local hazards and settle into the work. 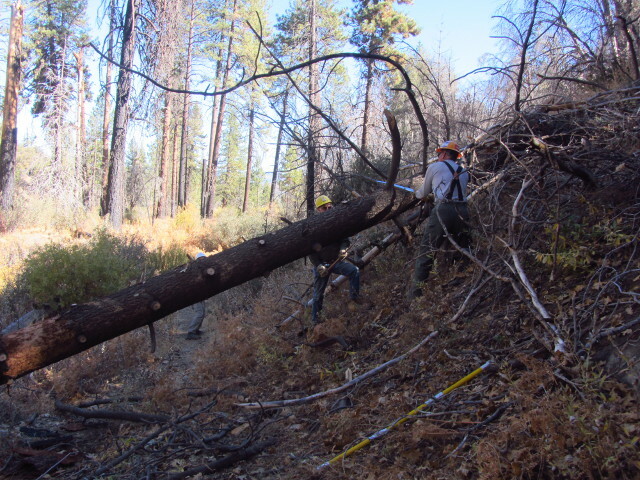 First, we clear the trail of debris and remove all limbs hanging over it, then we get out the big saw and get to work on the tree itself. Ax and Silky saws for limb removal on the trunk prior to trunk removal. The collapsible McLeod in the foreground is quite nice, too, although we aren't doing any tread work.